In the 19th century New York City was rapidly spreading northward up the island of Manhattan. The previously mentioned rock outcroppings were strewn across the land bounded by 5th and 8th Avenue and 59th and 106th streets. Along with swamps and bluffs, these large Manhattan schist boulders contributed to the notion in 1853 that this area of Manhattan was undesirable for private development. In 1853 the state legislature authorized the City of New York to use the power of eminent domain to acquire more than 700 acres of land in the center of Manhattan. 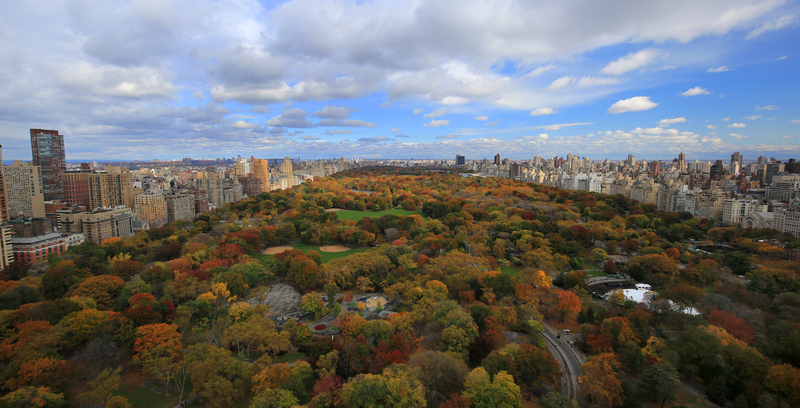 Four years later, the Central Park Commission held the country's first landscape design contest and selected the "Greensward Plan," submitted by Frederick Law Olmsted. The design sought to create a pastoral landscape in the English romantic tradition and Central Park became the first landscaped public park in the United States. Fortunately, for climbers, Olmstead's design left many of the rock outcroppings intact. While the history of the park is well documented, the history of climbing activity in the park is not. There are no formal annals of ascent. Information as such is so vague and informal, with these qualities reaching far back into the shrouded recess of the unremembered past, that the concept of a first ascent is questionable at best and commonly considered absurd by most locals. It is important to keep in mind that since the time of the Golden Age of Alpinism, thousands of climbers have visited Central Park; including such notables as George Mallory, John Gill and Lynn Hill. In the 60s, Art Gran, Jim McCarthy and other "Vulgarians" from the Gunks made several forays into Central Park. Consequently, the entrenched attitude is, "Everything has probably been done already." However, due to the feasibility that some of the hardest problems were above the standards of previous eras, there is an ability to make a qualified indication of when some specific problems were probably first climbed. This guide does not record first ascents, but where possible, does give an indication of the historical context of what most believe are the more modern problems. However, the refusal to assign first ascents should not be construed as an attempt to dampen the enthusiasm for new route and route variation finding. Or calling a climb by whatever name one feels is appropriate. There is great satisfaction when one dusts off some dirty, unchalked little gem of a problem and boulders it out. This is a sport of ego and aesthetics. The idea is to not let the former compromise the latter. Since the better bouldering areas are extremely small in nature, many routes and their variations lie almost on top of another or side by side, often using some of the same holds. If you do not care about climbing a particular eliminate problem there is no need to bother about "ethics." Use this guide as a starting reference and go wherever you want. The same applies for people interested in discovering things completley on their own; they don't want or need a guide full of detailed instructions. But ... if you are interested in repeating the standard, classic, hard and historical problems, pay close attention to the descriptions within. Some climbs will be obvious while many others will not. If one is unclear about the "ethics" of a particular problem (i.e. what is considered "on" and what is "off" route) just ask. Usually there'll be someone around to give you the correct information. And they'll invariably tell you more than you need to know. When this guide was first created it used the Yosemite Decimal System to grade routes and problems. The reason for this was simple. At the time, the only commonly used bouldering grade system was the John Gill B ratings and only two known problems were considered hard enough to be rated B1. In addition, there were a number of routes that were not bouldering problems, but were climbs that required protection of some sort, be it on lead or top-rope, or would otherwise be considered free-solos of an extremely risky nature. Since then, John Sherman's V-scale has become the accepted standard for rating boulder problems. This new edition of the guide assigns V ratings for boulder problems and YDS ratings for longer routes. While I have made every effort to be as accurate as possible when assigning grades, it should be understood that some climbers may find these grades inaccurate. Locals are notorious sandbaggers. Not because they are severely arrogant competitors, but because most of them have fully "wired" the popular problems and thus the moves do not seem quite as hard as they might during an onsight attempt. The great thing about an online guide is that it is easily revised and updated. Any disagreements over grades, route descriptions or names should be emailed to nfalacc@earthlink.net. Additionally, any information concerning new problems or problems not included in this guide can be directed to the above. A Climber's Guide to Popular Manhattan Boulder Problems does not presuppose or grant permission to any persons to climb in New York City or any of the areas described within. This guide is only a reference to climbs that have already been established in the past. The author, in writing this guide, does not assume any liability for injuries, penalties or fines incurred by any persons attempting to climb at any area described or not described by this guide or anywhere else in New York City. ROCK CLIMBING IS A STRENUOUS AND DANGEROUS ACTIVITY. CLIMB AT YOUR OWN RISK. Dominic Azato, George Baird, John Blumenthal, Jeff Dahlgren, Ralph Erenzo, Nancy Farron, Dan Frankl, Christopher Gonzalez, John Harrison, Yukihiko Ikumori, John Joline, Komba, Christopher Lawrence, Sandy Mah, Vadim Marcovallo, Cesar Moreno, Paul Nick, Jim Rosselli, Tamaki Shintaro, David Sowerby, Stowe, Dennis Walker, Seth Walsh, Richard Worth, Preston Lear, Dimitri Kutusow, Jean DeLataillade.